Even top golfers run into “the shanks” from time to time. It's the most dreaded affliction in golf, and often difficult to resolve. A shank is caused by a swing path that delivers the hosel (where shaft connects to clubhead) into the golf ball, sending it sideways at a nearly 90° angle to the target line. Shanks tend to come in bunches, causing a fear that's hard to shake. Although shanking is technically a swing path issue, it's this fear that makes them so tough to cure. Once a golfer hits one shank with a particular club, he dwells on it every time he pulls that club. The negative thought process practically assures it will happen again and again. By far the most important step to solving the shanks is to use a club design in which you have confidence. Ultimately, confidence and trust in your clubs will enable you to take a full, proper swing through the ball, freeing you from fear and curing your shanks. Standard golf irons are the most common producers of shanks, because the hosel is ahead of (or sometimes even with) the clubface and close to the ground. This makes ball contact with the hosel much more likely. Fairway woods (which are available from the 3 to the 25-wood, to replace irons or wedges) offer the best solution. 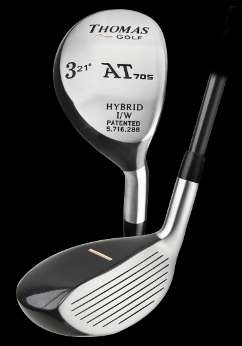 Their design puts the entire face forward of the shaft and hosel, for shank-proof golf shots. The shank is, by far, the most dreaded shot in golf. Of course, there are plenty of different kinds of shots that you can hit which will send your ball into bad places, but none of them are quite as nasty as the shank. When you hit a shank, the ball will shoot sideways across the fairway without ever getting more than a couple feet off the ground in most cases. Not only is a shank sure to do damage to your score, but it is likely to be rather embarrassing as well. Obviously, you will be far better off moving forward if you can find a way to take the shank out of your game once and for all. As you might imagine, that is going to be easier said than done. If you have been fighting a shank, you probably can't think about anything else while you stand over the ball. The shank has a way of taking over your game once it appears, and most golfers would give just about anything to make it go away. Of course, the only way to make it go away is through a combination of hard work, clear thinking, and patience. Golf is a hard game, and an issue like the shank is something that you have to approach with ample focus if you want to successfully eliminate it. If you are fighting the shank currently, don't feel too bad - this is a problem that affects even some of the best players in the world. You will see professional golfers on TV hit shanks from time to time, although they are typically able to make a quick correction when that does occur. Even though it is embarrassing to hit a shank in front of your friends or other golfers, you don't have to pack up your clubs and give up on the game after just one poor swing. In reality, a shank is actually only an inch or two on the club face away from being a pretty good shot. The margins between success and failure are extremely thin in golf, and that is especially true when it comes to the shank. In the content below, we are going to take a look at some of the possible fixes you can use to take the shank out of your game - or, at least, mostly out of your game. You can never completely remove the possibility of a shank from your swing, as all golfers make mistakes from time to time. However, if you can make the appropriate changes to your swing and to your mindset, you should be able to make the shank a rare occurrence rather than a regular problem. As with anything else in this challenging game, it is going to take some time for you to successfully make changes to your technique, so be patient and look for small improvements as you go. Before you can fix it, you first need to understand what is causing the shank to begin with. If you are going to be able to correct the swing flaws that are leading to the shank, it is imperative that you have a clear picture in your mind of how the shank develops. Most golfers don't even want to think about the shank, so they never take the time to learn about how it happens. Of course, it doesn't do you any good to run from the problem - dealing with it face on is the best way to rid yourself of this golf demon. The first thing you need to understand about the shank is the fact that the ball is coming off the hosel of the club at impact, rather than the toe. This is a common misconception about the shank, and it leads many golfers to attempt to fix the problem in the incorrect manner. Since the ball shoots off quickly to the right when you hit a shank, most golfers assume that the ball came off the toe of the club. More often than not, however, it is the hosel that is responsible for the shank. The ball will contact the club right at the point where the shaft comes down into the club head, and it will careen immediately to the right as a result. Understanding this simple fact will give you a much better chance to correct the problems in your swing that are leading to this undesirable result. Another important point to understand is that you might not necessarily be standing too close to the ball at address if you are hitting a shank. Many players believe that since the hosel is striking the ball, they must be standing too close. While it is possible that your position in relation to the ball is part of the problem, that is unlikely to be the entire issue. There are plenty of golfers who stand close to the ball at address, and most of them are able to avoid the shank successfully. It is useful to review the positioning of your stance as part of the process of trying to solve the shank, but don't assume that this is the underlying issue which will solve your problems once corrected. It is also possible for the lie of the ball to increase your chances of hitting a shank. When the ball is sitting on firm, hard-packed ground, you may run the risk of having the club 'skip' into the back of the ball at impact. This could happen when you hit the shot a bit fat, meaning you strike the ground prior to the ball. Normally, a fat shot would result in a large divot and a shorter than usual ball flight. However, if the ground is hard enough, your club may simply bounce off the surface and right into the back of the ball. This is a particular danger with a wedge in your hands, as your wedges will have a certain amount of 'bounce' on the bottom of the sole for this exact purpose. When you do find yourself on a hard-packed surface somewhere around the course, do your best to focus on clean contact in an effort to avoid any possibility of a shank. You probably aren't having much fun playing golf right now, assuming you are fighting with the shanks at the moment. However, there is good news - the fix that you need to get rid of the shank might be pretty quick and easy. In the list below, you will find a number of tips that have the potential to get you on the right track after just a bit of practice. Of course, there is no guarantee that these tips are going to successfully correct your shanks, but they are a great place to start. Work through these tips one at a time to see if they are the right remedy for your swing, and then move on to other options if the shanks persist. Maintain your knee flex throughout the swing. This just might be the best way to get right of your shanks. When you set up over the ball, you should have plenty of flex in your knees to engage your lower body properly. That is a great start, but it is only going to do you good if you manage to maintain that knee flex throughout the rest of the swing. Unfortunately, many amateur golfers give up their knee flex during the transition to the downswing, and they wind up standing straight up through impact. If you make this mistake, you are going to be bringing your hips closer to the body, and your hands will have to swing through closer to the ball as a result. In the end, you will be forced to move the hosel dangerously close to the ball as you make contact. If you can manage to maintain your knee flex through the shot rather than letting it go at the top, you will be able to hold your distance from the ball and the hosel should stay out of the way. Strengthen your grip. The grip plays a crucial role in many parts of the golf swing, and it can contribute to a shank as well. If you are shanking the ball on a regular basis, try turning your grip slightly to the right to strengthen its position. A stronger grip will make it easier to release the club head through impact, which is what you need to do if you would like to close down the toe and keep the hosel away from the ball. Note - strengthening your grip does not mean you should be squeezing tighter. Instead, it simply refers to the positioning of your hands on the club. Your grip pressure should remain light and relaxed throughout the swing. Set your hands lower at address. When you set up to the ball, try moving your hands a bit lower to encourage a flatter swing plane that moves around your back as opposed to up into the air. This can help guard against a shank because it will keep the toe away from the turf as you lead into the ball. With your hands set high, you will run the risk of having the toe of the club catch the turf just prior to impact - which will open the club face and bring the hosel in closer to the ball. 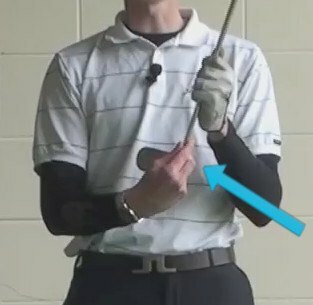 If lowering your hands doesn't seem to fix this problem, you might want to consider having the lie angle of your clubs checked. Clubs that are too upright for your swing can cause problems, so see a club fitting professional to make sure your equipment is a good match for your needs. Shorten up your backswing. This is one of those 'cause and effect' golf tips that might not make sense at first, but actually makes perfect sense once you think about the way one piece affects the next. One of the ways that you can wind up hitting a slice is by getting too much of your weight past the golf ball at impact. If you are leaning too far left by the time you swing down through the hitting area, you will struggle to release the club and the hosel will have a chance to strike the ball. Going back a step, one of the common reasons for golfers to get too far left at impact is by making a long backswing which pulls them toward the target prematurely. You might think of a long backswing as a good thing which can help you generate power, but it also can cause you to lose your balance. By tightening up your backswing (making it shorter), you should have an easier time keep your balance. Also, you likely won't lose any distance with a slightly shorter backswing, so don't worry about having your power taken away when you use this tip. Aggressively accelerate through impact. This is something you should be doing anyway, but it is easy to lose track of this point when you are fearful of a shank. After hitting your first shank, you likely will become a little bit tentative with your swing, as you are afraid of doing it again. Of course, this only increases the chances that you are going to shank another shot. Rather than playing scared, do your best to swing through the ball with total confidence and aggression. Good golf shots are hit with an accelerating club head, so commit yourself to swinging without fear regardless of the result. If you are able to convince yourself to trust your swing all the way through the ball, you likely can forget about the shanks altogether. As you practice your swing with the goal of eliminating shanks, work on each of the five points above. Some of those points might not really apply to your game, and some of them probably won't work for you at all. However, if you can get just one or two of them to have a positive impact, you will be well on your way to a shank-free future. Unfortunately, not every golfer is going to have their shanks fixed through the methods above. If you have given all five of those points a fair try and none of them have done any good, you may need to get deeper into your swing to figure out how to put the center of the club face on the back of the ball once again. Golf, as you know, is a complicated game, and there could be several layers of swing issues that you need to unravel before everything comes together properly. When you reach this point in the process, the best thing you can do is turn to a local teaching professional for assistance. A qualified teaching pro will have experience working with players who are fighting the shanks, so he or she will know exactly where to start in an attempt to unravel this mystery. Why turn to a teaching pro? Simple – the golf swing is too complicated for you to sort through all on your own without the necessary training and background. Teaching professionals understand how to address a variety of swing problems through drills and practice techniques, so your local club pro likely has what you need to get on track once again. While it is possible that you could sort through your issues on your own eventually, there is no telling how long that process might take. The shank is the sort of thing that can easily rob you of your love for the game, so don't let it get that far. Take a lesson or two as soon as possible to get started moving in the right direction once again. As you are trying to pick a teacher for your upcoming lessons, don't automatically settle for the club pro at your local course. It may be worth it to drive a bit farther away to work with someone who specifically understands your needs. Call around and ask to speak for a moment with the teachers who are available at a given facility. Let them know that you are fighting a shank and see what they have to say. Some teachers will shy away from having to work on a shank, as it can be a tough problem to fix. Others, however, will embrace it and will see it as a challenge that they can conquer. Once you find a teacher that seems genuinely excited to work with you, ask about setting up an initial lesson. While you will probably get a good deal on lessons if you pay for more than one upfront, you should wait to commit to that option until you see if you actually like the way the golf teacher goes about their work. Once you try out one lesson, you can then lay out a plan for a long-term partnership if you enjoy their work and you think they can help you take care of this issue. There are plenty of great golf teachers out there, but there are a few bad ones as well – with a little homework and a few trial lessons, you should be able to find one in your area who is more than capable of getting the job done. Even when you have put in the work necessary to rid your full swing of the shanks, there might still be more work to do if you have been fighting with the shanks in your short game as well. It is possible to shank short shots just as you can shank a full swing, so don't overlook this part of the game when thinking about the shanks. When chipping from around the green, you can easily send the hosel into the back of the ball – especially if you are playing from a poor lie. Hitting a shank from around the green might not be quite as damaging as shanking a full shot, but it will certainly still cost you a shot or two. To avoid hitting shanks in the short game, you need to focus on the point about acceleration from the list above. It is usually when the club decelerates through the hitting area that a shank will pop up on a chip or pitch shot. By slowing down as you approach the ball, the club will not release as it should and the hosel will remain on a collision course with the ball at impact. To cure this issue, shorten up your backswing on chip shots and commit to moving forward with confidence. This is a little bit easier said than done, however, so be sure to spend plenty of time practicing your chipping to get comfortable with the idea of accelerating aggressively into the ball. Also, be wary of the shank when you set up with an open club face to hit a higher-than-usual shot onto the green. Opening up the club face exposes the hosel to the ball, especially when you try to swing from outside-in to add elevation to the shot. To help guard against a shank in this situation, line the ball up off the toe of the club at address, rather than the sweet spot. Making this adjustment will put the hosel farther away from the ball, and you should still be able to get the results you looking for by playing the shot slightly off the toe. Theshank is no laughing matter in the golf world. Hitting consistent shanks can make the game torture instead of fun, and you might find yourself losing the desire to play if you keep knocking the ball sideways off the hosel. Use the instruction provided above to get your game on the right track and make sure that the shank is not a significant part of your golfing future.